Zion Market Research has published a new report titled “Vascular Stent Market by Product (Coronary Stents, Peripheral Stents and EVAR Stent Grafts), by Type (Bare Metal Stents, Drug-Eluting Stents, and Bioabsorbable Stents), by Mode of Delivery (Balloon-Expandable Stent and Self-Expanding Stent), by Material (Metallic Stents and Polymeric Stents), and by End-User (Hospitals, Cardiac Centers, and ASC’s): Global Industry Perspective, Comprehensive Analysis and Forecast, 2017 – 2024”. According to the report, global vascular stent market was valued at approximately USD 8.13 billion in 2017 and is expected to generate revenue of around USD 13.62 billion by the end of 2024, growing at a CAGR of around 7.65% between 2018 and 2024. Stents are the type of medical devices that can be permanently placed into the artery and narrow blood vessels which helps to keep the artery & narrow blood vessel open and functional. Vascular stents are the type of stents which are commonly placed in the part of the peripheral artery. Stents are generally made up of metal mesh and fabric. Covered stents and bare stents are two different types of stents. The vascular stent market is segmented on the basis of product, type, mode of delivery, material, and end-user. Based on the product, the vascular stent market is further segmented into EVAR stent grafts, coronary stents, and peripheral stents. Peripheral stents are further sub-segmented into renal artery stents, carotid stents, iliac stents, femoral stents, and others. The EVAR stent-graft segment includes abdominal aortic aneurysm and thoracic aortic aneurysm. The coronary stent market is expected to dominate the market in the forecast period due to the increase in the prevalence of coronary artery diseases and the rapid advancements in the technology of coronary stents. On the basis of type, the market is further segmented into drug-eluting stents, bioabsorbable stents, and bare metal stents. The drug-eluting stents are projected to lead the vascular stent market in the forecast period. The advantages of drug-eluting stents such as the low risk of restenosis over the bioabsorbable stents and bare metal stents are expected to fuel the growth of drug-eluting stents segment. Based on the mode of delivery, the vascular stent market is sub-segmented into self-expanding stent and balloon expandable stent. Balloon-expandable stent segment is anticipated to dominate the vascular stent market in the near future. The increase in the number of research activities which focuses on advancing the balloon-expandable stent technology and an increase in regulatory approvals for use of balloon-expandable stents are some of the factors driving the growth of balloon-expandable stent segment. The end-user segment includes hospitals, cardiac centers, and ASCs. The hospital segment is expected to dominate the end-user segment due to the presence of a large patient pool in the hospitals. Europe, Latin America, North America, Asia Pacific, and the Middle East & Africa are the regional segments of the global market. North America is anticipated to dominate the market in the forecast period due to the increase in the adoption of minimally-invasive surgeries and an increase in obesity rate which leads to cardiovascular disorders. The increase in the geriatric population and an increase in the cardiovascular disease & coronary artery diseases are fueling the growth of the European vascular stent market. In the forecast period, Asia Pacific is expected to follow North America and Europe due to increasing in the occurrence of cardiovascular diseases and vessel-related blockages because of the changing lifestyle. Also, the increase in a number of various companies for the investment in this region and the launch of the technologically advanced product by them is expected to fuel the growth of the vascular stent market. Latin America & the Middle East & Africa is expected to show slow growth rate in the forecast period. 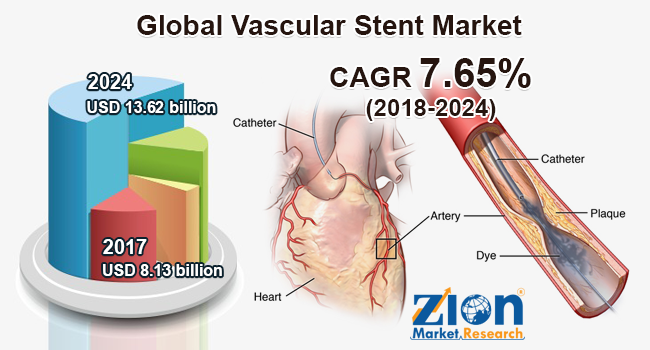 The increase in adoption of Western culture which increases the occurrence of heart-related diseases is expected to fuel the growth of the vascular stent market in this region. The key players in the global vascular stent market are Boston Scientific, Cardinal Health, Cook Medical, Medtronic, B. Braun Melsungen AG, Terumo Corporation, Abbott Laboratories, Goodman Co. Ltd., Biotronik SE & Co. KG, and Vascular Inc. The company focuses on the merger for expanding their businesses and introducing new technologies in other areas. For instance, in 2018, Boston Scientific Corporation announced that it has acquired VENITI, Inc., a company that has developed the VICI VENOUS STENT System which treats venous obstructive disease.